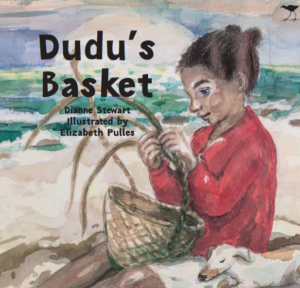 When Dudu finishes weaving her first basket, by the light of the plump full moon, her uncle Jojo tells her that a first basket should always be given away … Baskets, woven from locally sourced materials are widely used and re-used in African society. Dudu finished weaving her first basket as the plump full moon rose and lit up the twilight sky. “Look, I made it myself,’ Dudu said, showing her uncle her finished basket, made from Ilala palms that grow in sandy soils near the Indian Ocean. Uncle Jojo smiled. ‘You shouldn’t keep that basket, Dudu. Your first basket should always be given away.’ Dudu clutched her basket tight against her chest. ‘Tomorrow I’m taking my baskets to the roadside stall. Would you like to sell yours as well?’ asked Uncle Jojo.